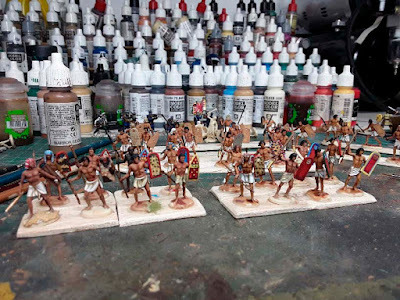 Another project for the start of 2018, some Nexus/Atlantic Egyptian infantrymen. They're not finished yet. Nice work. Don't have a rule suggestion as it is not my period. What rules did used to play with them? Not sure many would say they qualify as "fun" – but I'm not rebasing !! Also, I still like them – although I'm aware that most people see them as rather old fashioned. Back then they were cutting edge !